Simpson Strong-Tie panel sheathing clips are used to brace unsupported sheathing edges and provide a 1/8" gap to address shrinkage and expansion of roof sheathing. Span rating and Maximum Roof Sheathing Spans are for reference only. Refer to 2015 IBC Table 2304.8 (3) for additional important information. 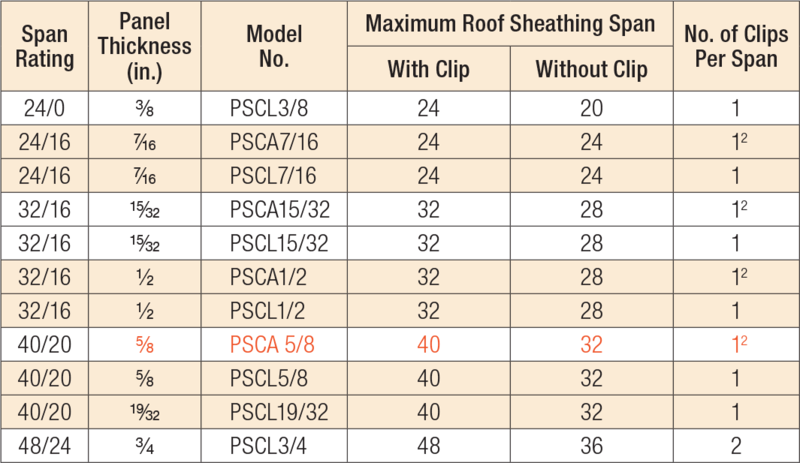 Maximum roof sheathing span with a single PSCA is 28". For spans > 28", use two PSCAs. PSCA See specific model numbers for code listings. PSCA 1/2 No evaluation report listing. PSCA 15/32 No evaluation report listing. PSCA 7/16 No evaluation report listing. PSCL See specific model numbers for code listings. PSCL 1/2 No evaluation report listing. PSCL 15/32 No evaluation report listing. PSCL 19/32 No evaluation report listing. PSCL 3/4 No evaluation report listing. PSCL 3/8 No evaluation report listing. PSCL 5/8 No evaluation report listing. PSCL 7/16 No evaluation report listing.